Enjoy the communal dinners. Every evening a delicious meal is prepared and there are always plenty of drinks and snacks available. 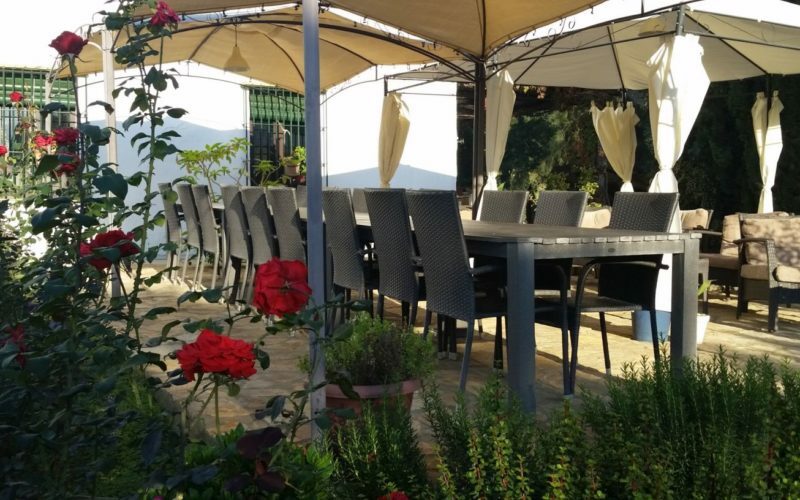 Staying with Bed and Breakfast Maravilla Verde, means that you will enjoy tasty food! 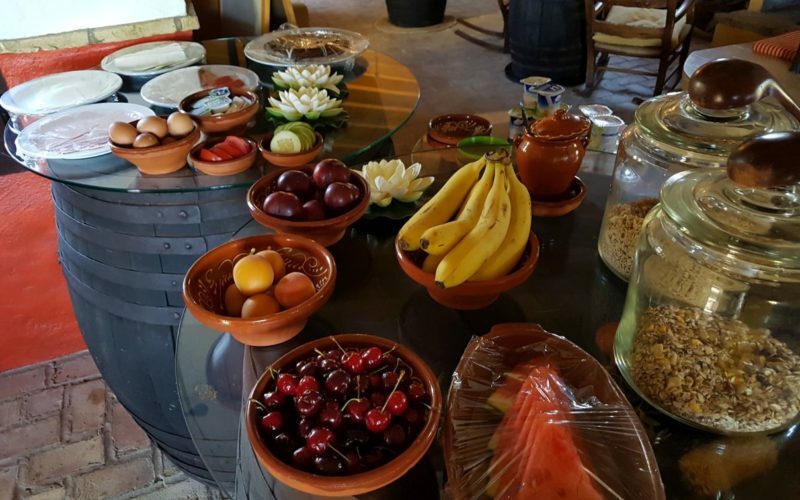 We offer a plentiful rich breakfast buffet with a lot to choose from. Different types of bread, varied sweet and savoury spreads, coffee, tea, milk, fresh orange juice, various yoghurts, muesli, fresh fruit and Spanish cakes. For the little ones (and the grown-ups) we make pancakes or some other delicious surprise. We can also provide gluten-free bread if you specify it in advance. Our outdoor bar is always filled with cold drinks, which can be purchased for a friendly price. And you can use it all day long. There is also a pool bar. How easy is that! You must also try the Tinto de Verano (summer wine). This is a mix of red wine with ice and a sort of soda. Many think that Sangría is THE Spanish drink, but that is not true. 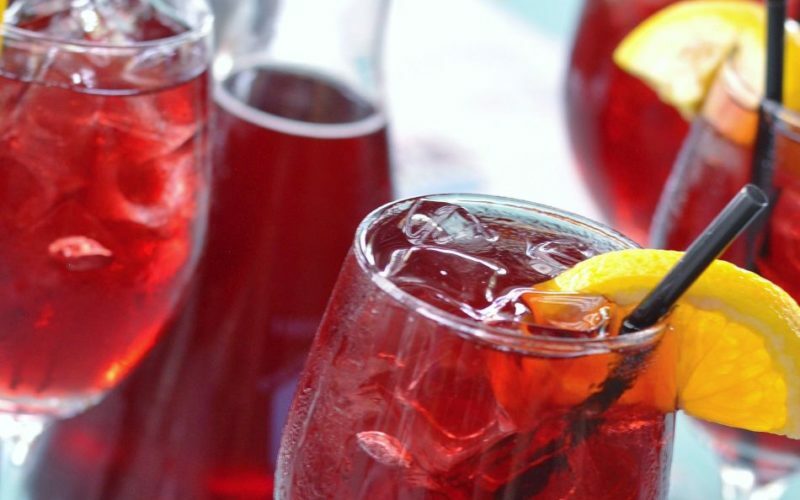 Everyone drinks Tinto de Verano in Spain and you can order it on any terrace or in any bar. Cheers, or as we say here, Salud! If you want to stay at the B&B the whole day, we also have a few snacks available at the pool for lunch. For instance you can prepare a croque monsieur or noodle soup, and even bake a pizza. Every evening you can join us at the communal table for a Spanish-oriented dinner. We try to use as many local and fresh ingredients from the region as possible. About once a week we light the barbecue and also once a week you can eat unlimited paella. 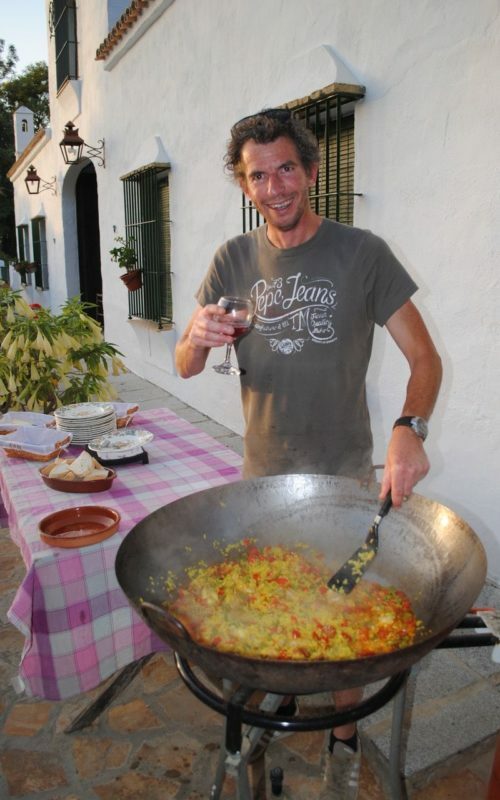 Our guests say that this is the best paella you can eat in this area! Every evening we end dinner with a delicious sherry from the region, whilst chatting to all the guests about their great day in magical Andalucia. Almost all year round, you can sit outside to eat either in the shadow of the trees or in the sunshine on the terrace. Eating together at the long tables is a great opportunity to meet other guests. All of our guests are happy to come back to the B&B in time for dinner and enjoy the delicious meals and the company of fellow travellers. If desired we can cook a little earlier for small children so that the parents can dine quietly while the children sleep or entertain themselves. On a regular basis we go with all the guests for tapas in the village. Spanish Pepa welcomes us with open arms and proudly serves us all her own home-made Spanish tapas. Do you have an allergy or would you prefer to eat vegetarian food? Please let us know in advance and we will take this into account.